Joy Creek Photo Archive (c) all rights reserved It is hard to imagine the early spring garden without shrubs like Viburnum x bodnantense 'Charles Lamont'. They bring beautiful, fragrant flowers and then slender leaves with cherry red petioles on elegantly arching branches. 'Charles Lamont' was named for the assistant curator at the Royal Botanical Garden in Edinburgh who first crossed V. farreri with V. grandiflorum in 1933. 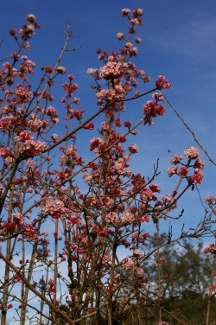 Viburnum x bodnantense 'Dawn' is similar, however, 'Charles Lamont' has larger leaves and is said to bloom earlier than 'Dawn'. This shrub is upright in habit with a more or less vase shape. The leaves turn red and gold in the autumn before they fall. Late Winter to Early spring. 10-12 ft. x 8-10 ft.